Had Saturday and Sunday scheduled with 2 great guys. 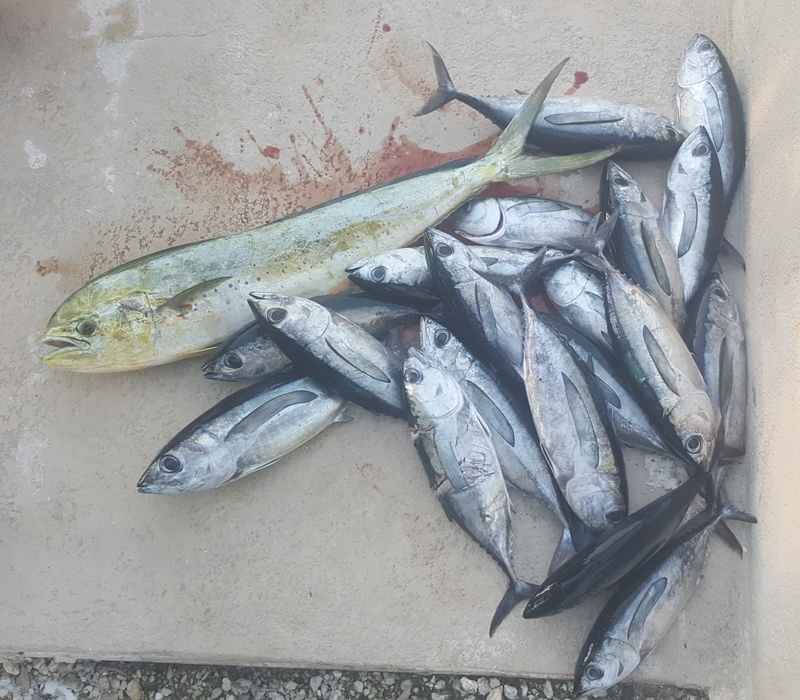 Plan was one day offshore and one day on the reef. Seas were a little rough but the World Cat can handle the nasty conditions. Saturday was the better of the two for going to the humps and when we arrived we had the place to ourselves. With the stream being south of us it set up a west current but the fish were still there. We trolled and jigged up several BFT and the bigger ones got taken by the tax man. We tried skipping them on the surface with a 50 wide to keep them away from the sharks. That would work unless you let up and then the sharks would bust the BFT on the surface like a bass plug. With plenty to eat and a couple of long battles with sharks it was time to hit the late afternoon troll. Headed in to 240 and set up the troll looking for wahoo. 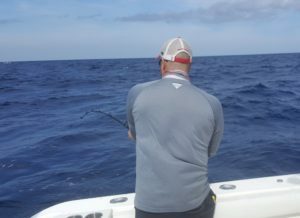 We trolled for miles and no hits on our spread of yo zuri bonita, big islander with fresh ballyhoo and a feather for BFT. We had pretty good water with occasional bay grass. We trolled 200 – 300 with little action. Finally the left rig goes off. Short burst but not the streaming reel of a wahoo bite. 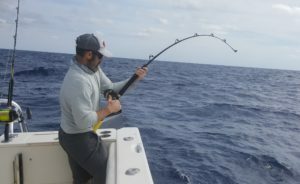 Todd grabs the rod and pulls in a nice Mahi. Put the spread back out and try a little closer in but the water gets dirty. With the sun going down and lots of fish to clean I point the nose of the cat toward Sister Creek and head in.